"Le Pianiste" redirects here. For the 2001 French film originally titled La Pianiste, see The Piano Teacher (film). The Pianist is a 2002 biographical drama film produced and directed by Roman Polanski, scripted by Ronald Harwood, and starring Adrien Brody. It is based on the autobiographical book The Pianist, a Holocaust memoir by the Polish-Jewish pianist and composer Władysław Szpilman, a Holocaust survivor. The film was a co-production of France, the United Kingdom, Germany, and Poland. The Pianist met with significant critical praise, and received multiple awards and nominations. It was awarded the Palme d'Or at the 2002 Cannes Film Festival. At the 75th Academy Awards, The Pianist won Oscars for Best Director (Roman Polanski), Best Adapted Screenplay (Ronald Harwood), and Best Actor (Adrien Brody), and was nominated for four other awards, including the Academy Award for Best Picture. It also won the BAFTA Award for Best Film and BAFTA Award for Best Direction in 2003, and seven French Césars, including Best Picture, Best Director, and Best Actor for Brody. It was included in BBC's 100 Greatest Films of the 21st Century. 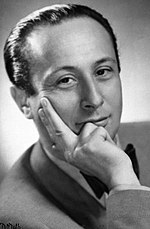 In September 1939, Władysław Szpilman, a Polish-Jewish pianist, is playing live on the radio in Warsaw when the station is bombed during Nazi Germany's invasion of Poland. Hoping for a quick victory, Szpilman rejoices with his family at home when learning that Britain and France have declared war on Germany. But the promised aid does not come. Fighting lasts for just over a month, with both the German and Soviet armies invading Poland at the same time on different fronts. Warsaw becomes part of the Nazi-controlled General Government. Jews are soon prevented from working or owning businesses, and are also made to wear blue Star of David armbands. By November 1940, Szpilman and his family are forced from their home into the overcrowded Warsaw Ghetto, where conditions only get worse. People starve, the guards are brutal, and starving children are abandoned in the streets. On one occasion, the Szpilmans witness the SS kill an entire family in an apartment across the street during a round-up. On 16 August 1942, Szpilman and his family are transported to Treblinka extermination camp as part of Operation Reinhard. But a friend in the Jewish Ghetto Police recognizes Władysław at the Umschlagplatz, and separates him from his family. He becomes a slave labourer, and learns of a coming Jewish revolt. He helps the resistance by smuggling weapons into the ghetto, on one occasion narrowly avoiding a suspicious guard. Szpilman eventually manages to escape, and goes into hiding with help from a non-Jewish friend, Andrzej Bogucki, and his wife, Janina. In April 1943, Szpilman watches from his window as the Warsaw Ghetto Uprising, which he aided, unfolds, and then ultimately fails. After a neighbor discovers Szpilman in the flat, he is forced to flee to a second hiding place. The new room has a piano in it, but he is compelled to keep quiet, while beginning to suffer from jaundice. In August 1944, during the Warsaw Uprising, the Armia Krajowa attacks a German building across the street from Szpilman's hideout. Tank shells hit the apartment, forcing him to flee. Over the course of the following months, Warsaw is destroyed. Szpilman is left alone to search desperately for shelter and supplies among the ruins. He eventually makes his way to a house where he finds a can of pickled cucumbers. While trying to open it, he is noticed by Wehrmacht officer Wilm Hosenfeld who learns that Szpilman is a pianist. He asks Szpilman to play on a grand piano in the house. The decrepit Szpilman manages to play Chopin's "Ballade in G minor". Hosenfeld lets Szpilman hide in the attic of the empty house. From here, he is regularly supplied with food by the German officer. In January 1945, the Germans are retreating from the Red Army. Hosenfeld meets Szpilman for the last time, promising he will listen to him on Polish Radio after the war. He gives Szpilman his greatcoat to keep warm, and leaves. In Spring 1945, former inmates of a Nazi concentration camp pass by a Soviet prisoner-of-war camp holding captured German soldiers and verbally abuse them. Hosenfeld, being one of the prisoners, overhears a released inmate lamenting over his former career as a violinist. He asks him whether he knows Szpilman, which he confirms, and Hosenfeld wishes him to beg Szpilman, to return him favor and help release him. Later the violinist and Szpilman reach the prisoners camp, but find it abandoned. After the war, Szpilman is back at the Polish Radio, where he performs Chopin's "Grand Polonaise brillante" to a large prestigious audience. An epilogue states that Szpilman died in 2000 at the age of 88, whereas Hosenfeld died in 1952, still in Soviet captivity. The story had deep connections with director Roman Polanski because he escaped from the Kraków Ghetto as a child after the death of his mother. He ended up living in a Polish farmer's barn until the war's end. His father almost died in the camps, but they reunited after the end of World War II. Joseph Fiennes was Polanski's first choice for the lead role, but he turned it down due to a previous commitment to a theatrical role. Over 1,400 actors auditioned for the role of Szpilman at a casting call in London. Unsatisfied with all who tried, Polanski sought to cast Adrien Brody, whom he saw as ideal for the role during their first meeting in Paris. Principal photography on The Pianist began on 9 February 2001 in Babelsberg Studio in Potsdam, Germany. The Warsaw Ghetto and the surrounding city were recreated on the backlot of Babelsberg Studio as they would have looked during the war. Old Soviet Army barracks were used to create the ruined city, as they were going to be destroyed anyway. The first scenes of the film were shot at the old army barracks. Soon after, the film crew moved to a villa in Potsdam, which served as the house where Szpilman meets Hosenfeld. On 2 March 2001, filming then moved to an abandoned Soviet military hospital in Beelitz, Germany. The scenes that featured German soldiers destroying a Warsaw hospital with flamethrowers were filmed here. On 15 March, filming finally moved to Babelsberg Studios. The first scene shot at the studio was the complex and technically demanding scene in which Szpilman witnesses the ghetto uprising. Filming at the studios ended on 26 March, and moved to Warsaw on 29 March. The rundown district of Praga was chosen for filming because of its abundance of original buildings. The art department built onto these original buildings, re-creating World War II–era Poland with signs and posters from the period. Additional filming also took place around Warsaw. The Umschlagplatz scene where Szpilman, his family, and hundreds of other Jews wait to be taken to the extermination camps was filmed at the National Defence University of Warsaw. Principal photography ended in July 2001, and was followed by months of post-production in Paris. The Pianist was widely acclaimed by critics, with Brody's performance and Polanski's direction receiving special praise. On review aggregator Rotten Tomatoes, the film holds an approval rating of 95% based on 181 reviews, with an average rating of 8.2/10. 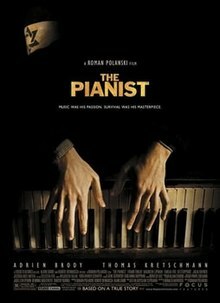 The website's critical consensus reads, "Well-acted and dramatically moving, The Pianist is Polanski's best work in years." On Metacritic, which assigns a normalized rating to reviews, the film has a weighted average score of 85 out of 100, based on 40 critics, indicating "universal acclaim". Roger Ebert of the Chicago Sun-Times gave a positive review of the film, noting that, "perhaps that impassive quality reflects what [director Roman] Polanski wants to say. ... By showing Szpilman as a survivor, but not a fighter or a hero—as a man who does all he can to save himself, but would have died without enormous good luck and the kindness of a few non-Jews—Polanski is reflecting ... his own deepest feelings: that he survived, but need not have, and that his mother died and left a wound that had never healed." Michael Wilmington of the Chicago Tribune said that the film "is the best dramatic feature I've seen on the Holocaust experience, so powerful a statement on war, inhumanity, and art's redemption that it may signal Polanski's artistic redemption". He would later go on to say that the film "illustrates that theme and proves that Polanski's own art has survived the chaos of his life—and the hell that war and bigotry once made of it". Richard Schickel of Time magazine called it a "raw, unblinkable film", and said that, "We admire this film for its harsh objectivity and refusal to seek our tears, our sympathies." Mick LaSalle of the San Francisco Chronicle said that the film "contains moments of irony, of ambiguity, and of strange beauty, as when we finally get a look at Warsaw and see a panorama of destruction, a world of color bombed into black-and-white devastation". He also said that, "In the course of showing us a struggle for survival, in all its animal simplicity, Polanski also gives us humanity, in all its complexity." A.O. Scott of The New York Times said that Szpilman "comes to resemble one of Samuel Beckett's gaunt existential clowns, shambling through a barren, bombed-out landscape clutching a jar of pickles. He is like the walking punchline to a cosmic jest of unfathomable cruelty." He also felt that "Szpilman's encounter, in the war's last days, with a music-loving German officer, "courted sentimentality by associating the love of art with moral decency, an equation the Nazis themselves, steeped in Beethoven and Wagner, definitively refuted". The Pianist was released digitally on 27 May 2003 in a double-sided disc Special Edition DVD, with the film on one side and special features on the other. Some Bonus Material included a making-of, interviews with Brody, Polanski, and Harwood, and clips of Szpilman playing the piano. The Polish DVD edition included an audio commentary track by production designer Starski and director of photography Edelman. Universal Studios Home Entertainment released the film on HD-DVD on 8 January 2008 with extras comprising the featurette "A Story of Survival" and rare footage of the real Władysław Szpilman playing his piano, as well as additional interviews with Adrien Brody and other crew. Optimum Home Entertainment released The Pianist to the European market on Blu-ray as part of their StudioCanal Collection on 13 September 2010, the film's second release on Blu-ray. The first was troublesome due to issues with subtitles; the initial BD lacked subtitles for spoken German dialogue. Optimum later rectified this, but the initial release also lacked notable special features. The StudioCanal Collection version includes an extensive Behind the Scenes look, as well as several interviews with the makers of the film and Szpilman's relatives. The piano piece heard at the beginning of the film is Chopin's Nocturne in C-sharp minor Lento con gran espressione, Op. posth. The piano piece that is heard being played by a next door neighbour while Szpilman was in hiding at an apartment is also an arrangement of Umówiłem się z nią na dziewiątą. The piano music heard in the abandoned house when Szpilman had just discovered a hiding place in the attic is the Piano Sonata No. 14 (Moonlight Sonata) by Beethoven. It would later be revealed that German officer Hosenfeld was the pianist. The German composition juxtaposed with the mainly Polish/Chopin selection of Szpilman. The piano piece played when Szpilman is confronted by Hosenfeld is Chopin's Ballade No. 1 in G minor, Op. 23, but the version played in the movie was shortened (the entire piece lasts about 10 minutes). The cello piece heard at the middle of the film, played by Dorota, is the Prelude from Bach's Cello Suite No. 1. The piano piece heard at the end of the film, played with an orchestra, is Chopin's Grande Polonaise brillante, Op. 22. Shots of Szpilman's hands playing the piano in close-up were performed by Polish classical pianist Janusz Olejniczak (b. 1952), who also performed on the soundtrack. Since Polanski wanted the film to be as realistic as possible, any scene showing Brody playing was actually his playing overdubbed by recordings performed by Olejniczak. In order for Brody's playing to look like it was at the level of Szpilman's, he spent many months prior to and during the filming practising so that his keystrokes on the piano would convince viewers that Brody himself was playing. Robinson Crusoes of Warsaw – Szpilman was one of the most notable persons to remain in Warsaw after its destruction by the Nazis and before its liberation by the Red Army in January 1945. ^ "THE PIANIST (15)". British Board of Film Classification. 3 July 2002. Retrieved 14 March 2015. ^ a b "The Pianist". Box Office Mojo. 2002. Retrieved 28 October 2016. ^ Hare, William (2004). LA Noir: Nine Dark Visions of the City of Angels. Jefferson, North Carolina: Macfarland and Company. p. 207. ISBN 0-7864-1801-X. ^ Szpilman, Wladyslaw. "The Pianist". Szpilman.net. Retrieved August 20, 2016. ^ "Festival de Cannes: The Pianist". festival-cannes.com. Retrieved 25 October 2009. ^ "Official Site - The Pianist - Awards & Nominations". FocusFeatures. Retrieved August 21, 2016. ^ "Roman Raymond Polański". Retrieved August 21, 2016. ^ "Xan Brooks talks to Joseph Fiennes about Hollywood and the theatre". Retrieved August 27, 2016. ^ a b "The Pianist - Movie by Roman Polanski". Retrieved August 21, 2016. ^ a b "Anatomy of a masterpiece". Retrieved September 4, 2016. ^ "In the ghetto with Polanski". Retrieved September 4, 2016. ^ "The Pianist (2002)". Rotten Tomatoes. Flixster. Retrieved 26 January 2019. ^ "The Pianist reviews". Metacritic. CBS Interactive. Retrieved 23 December 2012. ^ Ebert, Roger (3 January 2003). "The Pianist". Chicago Sun-Times. Retrieved 23 December 2012. ^ Wilmington, Michael (January 5, 2003). "Polanski's `Pianist' may put `profligate dwarf' in better light". Chicago Tribune. Retrieved November 25, 2012. ^ Schickel, Richard (December 15, 2002). "Have a Very Leo Noel". Time. p. 4. Retrieved November 25, 2012. ^ LaSalle, Mick (January 3, 2003). "Masterpiece / Polanski's 'The Pianist' is a true account of one man's survival in the Warsaw ghetto". San Francisco Chronicle. Hearst Communications. Retrieved November 25, 2012. ^ Scott, A.O. (December 27, 2002). "Surviving the Warsaw Ghetto Against Steep Odds". The New York Times. Retrieved November 25, 2012. ^ "The Pianist- Amazon". Retrieved September 4, 2016. ^ "The Pianist- High def digest". Retrieved September 4, 2016. ^ "StudioCanal Collection". Retrieved 24 June 2010. ^ "Problems with initial BD release". Retrieved 1 August 2010. ^ "The Pianist on BD". Retrieved 1 August 2010. ^ "A review of music from the motion picture The Pianist". Retrieved September 4, 2016.